JS Notifications is the simple yet very effective module all communities should have it enabled. It allows users to see their notifications on every site page. Just make sure you enable this module for registered users only as notifications don't have much sense for guest viewers. 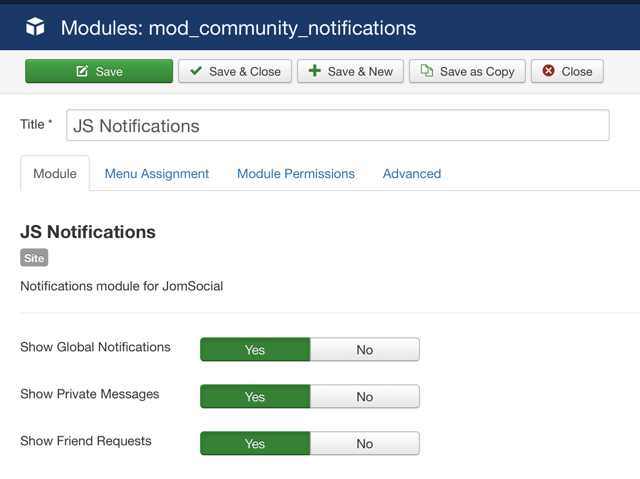 Show Global Notification - When enabled, module will show all JomSocial notification which user selected to receive. Show Private Message - Select Yes to show all new private message notifications. Show Friend Request - Select Yes to show all new friend request notifications.